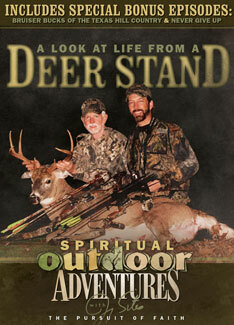 For the Christian outdoors enthusiast, this DVD features three episodes of Jimmy Sites’s popular “Spiritual Outdoor Adventures” television show (“A Look at Life from the Deer Stand,” “Bruiser Bucks of the Texas Hill Country,” “Never Give Up”). Special guests include author Steve Chapman at Legends Ranch in Michigan, C’Mere Deer developer Ivan Hawthorn in the hill coun­try of south Texas, and a father/son group in Saskatchewan’s Boreal Forest. In “A Look at Life from a Deer Stand,” Chapman’s insights into the Christian life are as solid as his bow hunting skills. “Bruiser Bucks” includes a discus­sion about God’s trophy room, and “Never Give Up” shows how God sees us through all things, always making us successful in the end.